Metal roofs have a significantly longer expected service life than either built-up roofing or single-ply roofs, according to a 2004 study of low slope roofing conducted by Ducker International, a Detroit-based research organization that specializes in construction materials. Metal roofing is often quieter than an asphalt shingle roof. When installed with solid sheathing, a metal roof on your facility will actually silence noise from rain, hail and bad weather better than other roofing materials. Fact: ONLY ADDS APPROX. 2 PSF. With retrofit roofing, the existing structure is more likely to support the additional roof system. Many times, on a flat roof, a new metal roof will weigh less than the gravel swept from the existing roof surface. Retro-fit roofing systems support roof-top units with the same if not better stability as any other roof system. Metal roofing materials come in variety of colors and styles. This allows style options you may not find in other roofing systems. Fact: NO ROOF REMOVAL; CAN DO WORK 12 MONTHS OUT OF YEAR. In most circumstances, a new roof can be installed without having to remove the existing flat roof. This allows for minimal disruption of business operations. Fact: REFER TO ITEM #1 ABOVE!!! Most roof retrofit work adds slope to an existing flat roof, this option can generate a strong returns in the form of lower energy costs and very little or no maintenance for decades. Originally printed as A Long-Term Solution by Chuck Howard, P.E. A recent article published in the Mt. Airy News, Mt. Airy, N.C., covered a retreat taken by the Dobson, N.C.-based Surry County Schools (SCS) board. During this retreat, it was reported by Robert Draughn, maintenance director for SCS, that the Raleigh-based North Carolina State Department of Public Instruction “recommends that the lifespan of the average school building is 50 years.” Draughn stated in the article that by 2015 more than 50 percent of the schools in SCS’ district will be more than 50 years old. As these buildings and other schools across the Carolinas are scheduled for repair or replacement of their components, including roof systems, it would make financial sense to consider components that will yield the lowest lifetime cost. To assist in finding such components, the Ottawa, Ontario, Canada-based Athena Sustainable Materials Institute (www. athenasmi.org), an international non-profit research collaborative bringing life-cycle assessment to the construction sector, has established an assumed building service life of 60 years, being defined as the minimum expected service life, for all building components, including the roof component. Athena’s life-cycle assessment (LCA) is accepted by many U.S. building component associations as the best indicator of the total cost effect a building component has. Based on the recommendations of the North Carolina State Department of Public Instruction and Athena, it appears reasonable that school buildings should use building components that will last at least 50 to 60 years. 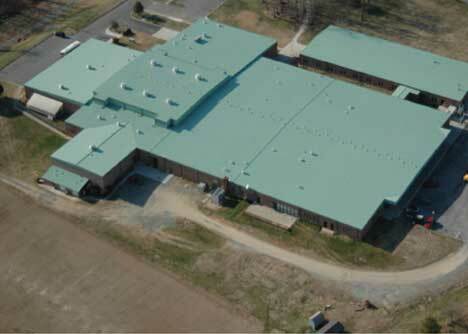 Galvalume-coated metal roofing is currently being used in school construction and renovation throughout North Carolina because it has the actual experience of more than 25 years of service with a projected life of at least 50 additional years for a total 75-year-plus life expectancy. A recent and ongoing study, sponsored by the Zinc-Aluminum Coaters Association and the Glenview, Ill-based Metal Construction Association, of 11 low-slope Galvalume-coated metal roofs that have been in place for 25 to 35 years is demonstrating that these roofs, in the real world, are performing in a manner that exceeds their initial expected life. In non-coastal U.S. regions (defined as regions more than 1 mile from saltwater), the study demonstrates Galvalume coating will protect metal roof panels for a period longer than the 50 years required by the North Carolina State Department of Public Instruction. As stated in the study’s findings, the actual deterioration rate of the Galvalume coating is only affected by the pH of the precipitation; the lower the pH, the higher the acidity of the precipitation (acid rain) and the lower the projected panel life. (Read an online exclusive providing the details of the study, published by retrofit magazine, at retrofitmagazine.com/galvalume). In 1989, Brunswick County Schools (BCS), Bolivia, N.C., needed to replace the roofs on all three of its high schools built in the mid ’70s. The district had very little knowledge of metal roofs at the time but decided to allow a local architect to design a metal retrofit roof conversion for the existing roofs. Because these roofs were already sloped, a simple overlay of a standing-seam metal roof with a Galvalume protective coating of the base steel panel was sufficient and cost-effective. All three high schools, totaling more than 300,000 square feet, were reroofed while school was in session during the 1989-90 school year. During a survey of the BCS roofs conducted in 2011, the North Brunswick high school original retrofit metal roof was inspected and photographed. It was determined the roof was functioning properly. It hadn’t had any maintenance and could be expected to function in this manner as long as the Galvalume weathering surface remained sound. A visual inspection of the other two high schools revealed similar expectations. From the time the BCS high-school roofs were retrofitted with metal until 2011, BCS primarily had chosen sloped metal roofs for its new construction and implemented a maintenance program for all non-metal roofs. In 2011, BCS utilized an LCA with respect to the district’s future roof construction approach and determined a metal retrofit roof program for the school system’s remaining roofs should be implemented to receive the long-term performance and cost benefits the district required. In 2012, one of BCS’ middle schools, measuring more than 100,000 square feet, was retrofitted with a metal roof, converting a flat roof to a sloped roof. In early 2013, a portion of one of BCS’ elementary schools of approximately 15,000 square feet received the same type of conversion. In the second quarter of 2013, a second middle school, again totaling more than 100,000 square feet, was contracted to have the same metal retrofit roof approach, including the use of a Galvalume-coated roof component. In 1989, Davidson County Schools (DCS), near Lexington, N.C., elected to try converting its flat roofs to sloped Galvalume-coated metal roofs. The first project was East Davidson High School, Thomasville, N.C. During the next 20-plus years, the school system has managed to retrofit more than 20 roofs, accounting for more than 1.2 million square feet of roof area. Like Brunswick County, DCS researched the available data and determined Galvalume-coated metal roofs would be the most cost-effective solution to the school system’s roofing needs. At this time, the majority of DCS’ school roofs are covered with a Galvalume-coated metal product. In the late 1980s and early ’90s, Pamlico County Schools, Bayboro, N.C., initiated and completed a program for covering all its school roofs with Galvalume-coated metal. Because this is one of the poorest districts in North Carolina, the conversion was a financial challenge but administrators believed it was the best use of the district’s precious resources. All the school system’s campuses were totally covered with Galvalume-coated metal roofs, converting flat roofs to sloped roofs. After a brush with a hurricane in the fall of 2011, which closed schools, businesses and emptied the state prison in Bayboro, a visual inspection of these metal retrofit roofs was completed and determined only a few pieces of trim had been damaged; the main roof areas were intact and functioning as designed. It is important to note a Galvalume coating protects the metal panels, but if the roof is not designed and installed properly, the roof system will not endure. A retrofit metal roof system, using a Galvalume-coated standing-seam metal roof, will provide the building with a roof panel that will last well beyond its “assumed service life.” The stigma that these roofs are “too expensive” is simply not true when analyzing the roof cost using a life-cost analysis method. However, the roof must be designed properly, composed of concisely manufactured products and installed as it is designed. When those elements are in place, a building owner can expect to have a great experience with his or her roof for years to come—even well beyond the current life expectancy of 50 to 60 years. A metal roof retrofit system is a structural system that needs to be designed by a licensed professional engineer to meet the applicable building code laws in the jurisdiction where it exists. This means that a licensed P.E. that is familiar with light-gauge framing and roof loads should be involved with the design of the roof system as these characteristics relate to the particular roof and the local area. The wind pressure needs to be calculated using the current edition of the ASCE 7 manual (currently the 2005 edition in North Carolina and 2010 edition in South Carolina), and the roof system panels need to be analyzed using the ASTM E 1592 standard test. In addition, the capacity of the existing roof structure needs to be analyzed to verify that it can support the new retrofit roof plus the current wind and snow loads. Only metal roofing materials that are suited for this type of roof assembly should be used. There are numerous metal roofing suppliers that manufacture a structural standing-seam roof system capable of spanning between the purlins of the retrofit system used to create slope. Also, only panels that have been properly tested to determine their load limits, per ASTM E 1592, should be used. A retrofit metal roof system must be installed by an experienced contractor who will ensure it is erected per the design and manufacturer’s instructions. If these conditions are met, the roof renovation will be a success.